Remember Hergé’s Bianca Castafiore and her famous Jewel Song that described her love and attachment to her gold and other precious jewels? Or, Aparna Sen’s ‘Goynar Bakso’- the image of a child-widow guarding the timeless and classy wooden box of the then latest gold jewellery designs? The examples cited above give a clear image of the love both fictional and non-fictional women have for gold ornaments. This love has remained stable over centuries and has given rise to a worldwide craze for timeless and chic, light and modern pieces of jewellery. Thus, artisans create new trending jewellery and at times tweak the traditional ones. New exquisite collections of ornaments are launched to draw the sparkly and sophisticated eyes of auric lovers. The recent trend has however shifted to vivid and sober coloured precious stones embedded in gold jewellery and simplistic textures of gold designs. The artisans also keep in mind chic trend based on colour for jewellery. For example, rose gold is probably one of the most popular colours. They can be seen appearing even in nail paint and cellphone flip covers. Noticing this trend, a wide range of jewellery has been launched in the rose gold colour. In case you feel like selecting your ornament from a range of trending latest gold jewellery designs, you have a catalogue right here. 2. Open weave lattice design necklace – This design has become very popular for the weave pattern in the pendant and the strawberry gold colour in which it is available. 3. Gold crescent star and moon necklaces – Celestial shaped pendants have become a trend in the last 2-3 years. Stars and moon in solid gold or studded with a solitaire have become a desirable design. 4. Long chain earrings – Pearl danglers from sleek chains of 14k rose gold is a new trendsetter for regular use. Diamonds and emeralds are also used in place of pearls. 5. Bangles – The presence of bangles on the wrists imparts an elegant look. The sleek and sophisticated diamond-studded bangles are available in yellow, white, and rose gold textures. The designs available are varied based on customer requirement. 6. 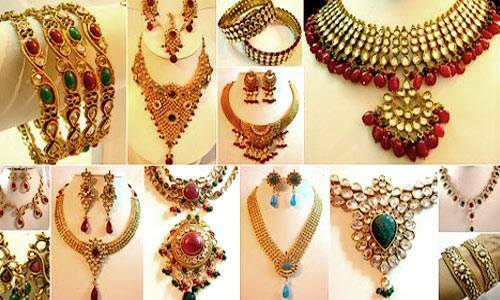 Mangalsutra – This piece of jewellery is a symbol of marital life. Tweaks by artisans on this have transformed the look of it. People are following celebrities and their customised mangalsutras. Therefore, we have the basic structure of alternate gold and black beads with a pendant in the centre. Sometimes additional studded zodiac signs or plain diamond solitaire are added to the traditional mangalsutra. These glamorous trends and eye-catching sleek designs sparkle with sophistication. They tend to create a lasting impression on the people around. So get yourself a selected and customised collection of trending jewellery and let the beholder be charmed with your radiant and elegant persona.